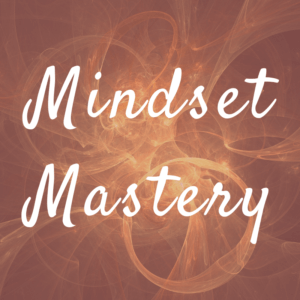 What is Mindset Mastery, you ask? Mastery is all about awareness, alignment, and action. Step 1 is always awareness. We have to become aware of our thought patterns, because they create emotional responses, which lead directly to our actions and what we perceive to be happening in the world around us. We achieve awareness through meditation, through inquiry or journaling, and through conversation with someone skilled at asking juicy questions. Some people get Ahas while in nature, or exercising. Some people get Ahas through their dreams. It doesn’t matter how self-awareness comes to you, only that you pursue it. There are two aspects of alignment. One is the alignment of our conscious thinking and our subconscious thinking, or alignment of our forebrain (higher cognition) and our lower brain (instinctual programming). When we consciously know that we are worthy of respect in our relationships, but somewhere along the way we internalized the opposite programming, the conscious and subconscious minds are out of alignment. When this happens, you find yourself in disrespectful, or hurtful relationships, for instance. You’ll find yourself in self-sabotage, and out of personal integrity. The other aspect of alignment is when our thoughts, words, and actions are aligned with our values. This is personal integrity. This fundamentally hinges on conscious and subconscious alignment, but you can think of it as alignment in action. Once awareness is achieved (and this is a process of forever going deeper within ourselves), and alignment is realized, we are able to take inspired action. We begin to live by our values. We self-actualize; we begin to create the life we know is possible for us. In the above example, we outgrow those stuck relationships that were grounded in outmoded programming. We evolve. We heal. We find more peace and happiness in our lives. We inspect our thought processes, we challenge the old programming, we reprogram, we grow. We close the gap between who we are being now and who we want to be, and how we are perceived on the outside vs. how we feel on the inside. So how do we achieve this alignment, which leads to inspired action? The fastest, most comprehensive mindset tool I have experienced to create alignment between your conscious and subconscious minds is PSYCH-K. Once you become aware that you would like something different in your life, in a matter of just a few minutes, you can create a shift that leads to real change. Most of the people I have worked with can actually feel this shift in their body after completing a PSYCH-K balance. It is potent and powerful, and the changes I have witnessed in other people’s lives (and my own, thank you very much) are nothing short of astounding. Getting started is simple. Just take an honest inventory of your current situation and ask: What would I rather be experiencing right now? Whether you want to experience making more healthful decisions (fewer donuts, or fewer codependent relationships, for example), or the ability to consistently speak up for yourself or ask for what you want, or improved connection with others, PSYCH-K can help. If you are curious and would like to know more about PSYCH-K, please check out this video by Rob Williams, the founder of PSYCH-K. Bruce Lipton also writes about it beautifully in his book, The Biology of Belief. Anné M. Klint is a certified PSYCH-K® Master Facilitator. As a gift to her community, she is offering Mini Mindset Mastery Sessions for Magical Holidays. As someone who has struggled emotionally and physically with the holiday season, PSYCH-K has made the holidays actually tolerable, and dare I say fun! Don’t let the holidays derail your personal goals for health, happiness, and connection. Set up a Mini Sesh today and transform an old crappy pattern of yours into a shiny, new one. These deeply discounted sessions are in high demand and short supply. And they’ll be gone soon. So jump on it! Have a question? Send me an email, or simply set up a free 20 minute Discovery Call.